Don’t worry over roof leaks! Castile Roofing is here for you! Roof Leaks: the bane of every homeowner when it comes to their home. Here in the Valley of the Sun, we have that burden during the Monsoon Season. It also doesn’t help that the cause of the leak could take place during the scorching heat of the rain’s off season. Fortunately, you have an ally to fight this battle. Castile Roofing can help you overcome your problem of roof leaks today! The most common sign is water condensation. Here you see a pool of water build up due to poor arrangement of the roof’s tiles or how it is pitched. This seeps into the ceiling of the home where it can sit and go unnoticed, all the way down until enough builds up to notice. By then, water is already hitting your floor and the damage is significant. Another sign is mold and mildew buildup from blocked passages. The roof itself cannot be airtight. It has to release heat outside to help with cooling cost. 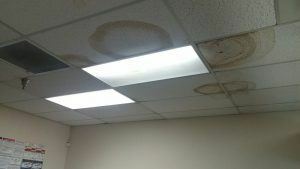 But this can also cause the rise of mold and mildew if left unchecked. This is further damaged if left alone and the rainy season hits. Now you have not only roof leaks but a smelly mess of mold to contend with. Save yourself the pain of roof repair. We at Castile Roofing want to make this problem a thing of the past. When dealing with roofs leak repairs, you have the confidence of our 10+ years of experience. Our trained professionals have worked with homes across the Valley in terms of styles of roofing. Regardless of the type of roofing materials used, our team can get your roof up and running again in a manner of moments. We continue to serve the Valley in the cities of Phoenix, Tempe, Scottsdale, Chandler, Avondale and all towns throughout the Valley of the Sun. Don’t let that leak get out of your control! Contact us to get your roof fixed asap!